It may not seem like it, but we’re rapidly approaching the release date for Red Dead Redemption 2. As such, Rockstar is releasing more information about the long-awaited title. This time, the developer is giving us a closer look at some of the characters that will be encountered in the Wild West through a series of character posters. The posters showcase the members of Dutch van der Linde’s gang, who make up the central canst in Red Dead Redemption 2. The images were released piecemeal over on Rockstar’s Twitter account, and we may still see more come out. While the posters don’t give a ton of info away, they do include some juicy quotes that hint at where their story may go. We first got a glimpse at the outlaw gang back in the Red Dead Redemption 2 gameplay reveal trailer. You can check out the full gallery of Red Dead Redemption 2 characters in the gallery below. The most noteworthy inclusions are bound to be the members of the Martson family. Both John and his future wife Abigail are among the character posters released. 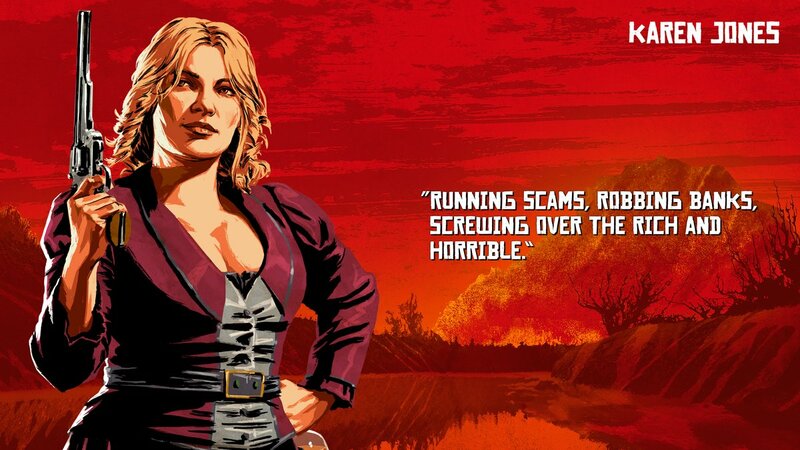 Their son Jack also got his own piece of art, though it is unknown if their daughter, who died prior to Red Dead Redemption, will appear in this game. With all this new information being rolled out, maybe we’ll see a new trailer in the coming days? Of course, as with a lot relating to Red Dead Redemption 2, all we can do is speculate. Red Dead Redemption 2 finally releases on October 26, 2018, for the PlayStation 4 and Xbox One. If you’re one of the many excited for Rockstar’s newest game, a new line of merchandise was recently announced.